I walk with a spring in my step towards any metro station! 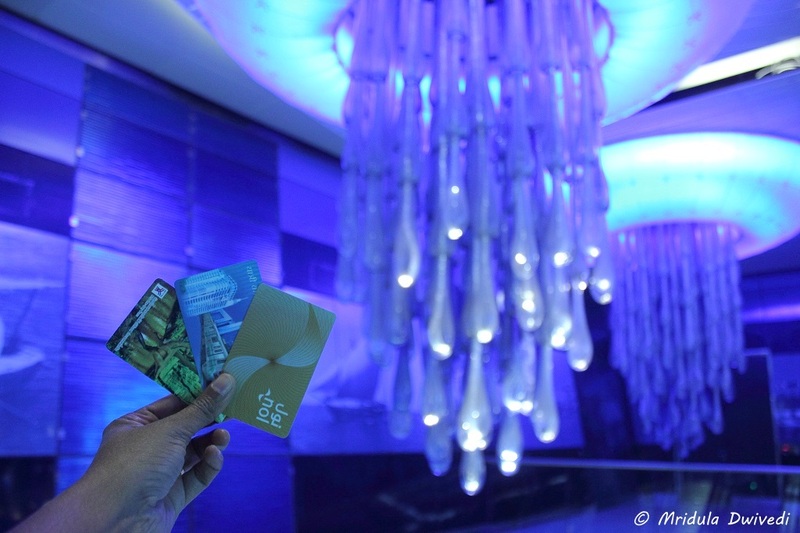 My kind hosts FlyDubai gave me pre-loaded metro cards to use and explore the Dubai city! I was on cloud nine, I was going to explore Dubai by Dubai Metro on my own! I have always liked metro trains, undergrounds, trams and other such modes of transportation but the obsession with them is recent. I have a theory about my I like metros so much. Given my poor sense of direction, metro is heaven sent for me. They usually drop me close to an attraction and I can always keep the station in my sight! It makes my life simple. I have now used metros in 4 countries India (Delhi), Thailand (Bangkok), UK (London) and Dubai but I have retained only three cards, I returned the Oyster Card in UK. As and when I use it the next time, I will keep that card as a souvenir too. Other than the Delhi Metro, photography is allowed on the others listed above. 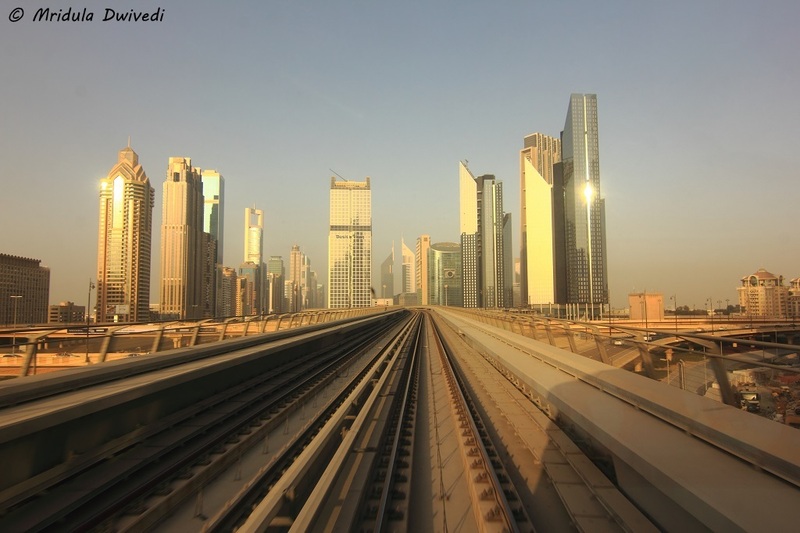 Dubai Metro is the longest driverless metro system in the world! Because it is driverless if you board the first and the last coaches you can look back at the tracks. This is not possible on the Delhi Metro as the first and the last block is for the drivers. I discovered this quite late into my Dubai trip. I still manage to take a few pictures and make a video. There were many other excited tourists doing the same in the coach. One of the coaches (not sure if it is the first or last) is the first class cabin which has a higher priced ticket, do remember not to enter it unless you have a first class ticket. Look at the color of my card, it is a gold card. But I did not realize it while traveling in the metro. I did not enter the first class cabin even once! Dubai metro was inaugurated by the King of Dubai Sheikh Mohammed Bin Rashid Al Maktoum on 09/09/09! The Women and Children Cabin! In Dubai Metro, like the Indian metro there is a coach reserved only for women and children. I traveled both in the general and women and children only coach. More than once, men along with their family or girl friends entered the coach. More often than not, they were tourists. They were always asked to leave the coach politely by the fellow passengers. There is a fine of 200 AED if you enter the wrong coach and if you get caught. Women can board any coach and I did it several times. People are well behaved, I never felt insecure or unsafe. I boarded the general coach more than the women and children coach without any problems. 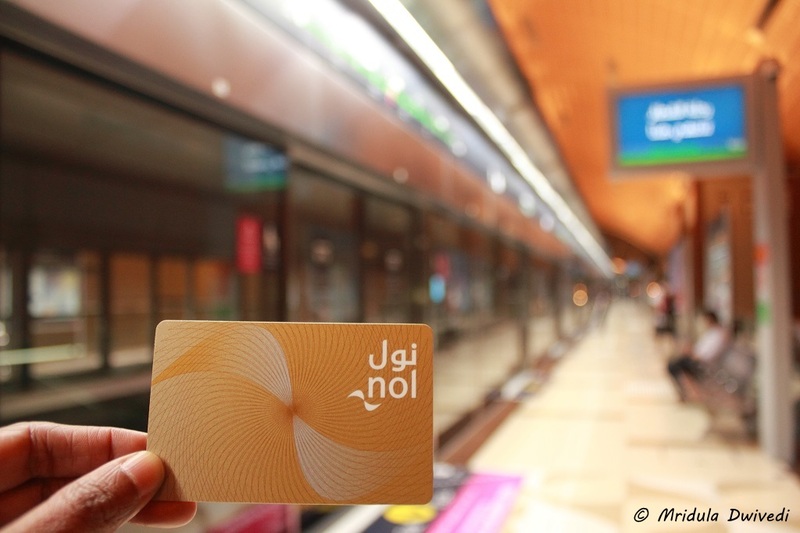 You need to purchase NOI cards to travel in the metro and pre-load them. There are cards for tourists too. As my card was pre-loaded by my hosts FlyDubai with a generous amount of money, I did not need to top it up again. As my friends did not use their cards, I had two with me. When I was low on money on the first, I simply used the second card. There are ticket counters and personnel at every station, so help is nearby if you need it. There are two main lines on Dubai Metro- Red and Green. 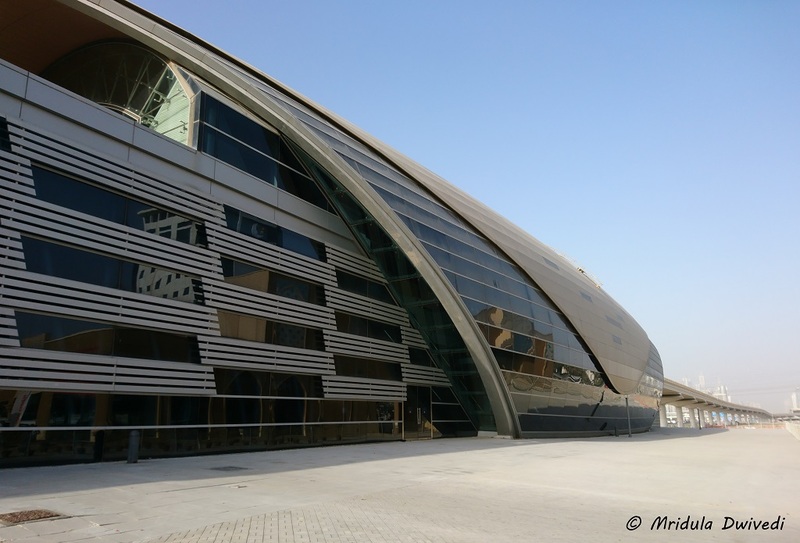 The closest station to my hotel, Melia Dubai was the Al Fahidi station on the green line. The one way taxi fare to the station was 12 dirham. I could change to the red line at the next stop Bur Juman. The other interchange station is Union but I never managed to reach there. I was told I could get the buses to Abu Dhabi from Union but I simply didn’t had time. I have noted it down for the next time. You can see a map of Dubai Metro here. 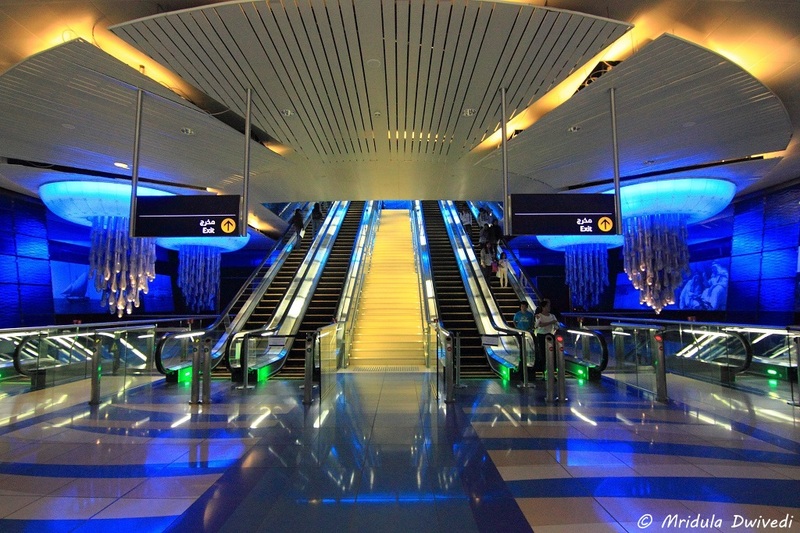 If you would ask me Bur Juman is the most beautiful metro station on the Dubai Metro. Even though I have not seen them all but I am sure that it is. It was my interchange station for the Red Line so I crossed it more than once and I was happy for it. The Dubai Metro gets crowded during the office hours, the women and ladies coach felt as crowded as Delhi Metro in the evening. I explored Dubai Mall, Burj Khalifa, Mall of Emirates, Ibn Batuta Mall and the Festival City Mall by Dubai Metro. 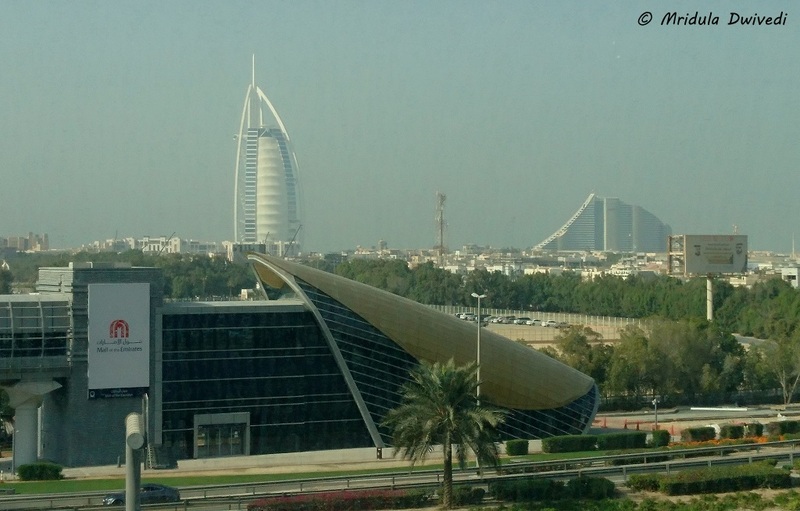 By the list of destinations you can see Dubai is a city of malls. Except for the Festival City Mall everything else is on the Red Line. The malls are so huge that I could not walk end to end even in one single mall, even though I love walking. I later realized that my nephew used to work at Mall of Emirates for his internship. Had I known it before, I would have gone into the high end furniture store he used to work at! If you wish to go to the Festival City one way to do it is to go to the Creek Metro Station on the Green Line. Walk out and go to the Water Taxi Station. For 50 dirham you can take a canal tour or for 2 dirham (one way) you can cross to the Dubai Festival City. I went to the Festival City. It was sunset time and I enjoyed a drink at the Crowne Plaza sky lounge on the 7th floor. I was actually chasing the sunset (the first picture in this post) but then it would have been too rude not to order anything and walk away after clicking pictures! By the next time I go I hope they have something really high up in the sky. I thoroughly enjoyed exploring Dubai by Dubai Metro. I hope my journey on the metro trains will continue in 2017 too!